We have wanted to make a canopy above the door that goes to the backyard of our house. We decided to take a risk and were very happy with the result, firstly it is much cheaper than doing it yourself, secondly installing a canopy took my wife and me about 20 minutes. It performs its functions. very pleased! Whether you're getting ready for warm weather or planning an outdoor event, ALEKO brand electricity-free retractable awnings provide shade and protection without having to worry about cumbersome electric devices. This model requires no electricity. It opens and closes easily in less than a minute, using a simple hand crank that operates smoothly and quietly. Optional accessories feature support arms, sold separatel, that can be positioned vertically on the patio floor, or angled back against your house wall to provide better fabric tension and overall stability. Another usefull optional part is a ceiling mounting bracket to attach your awning to the roof overhang of your house. 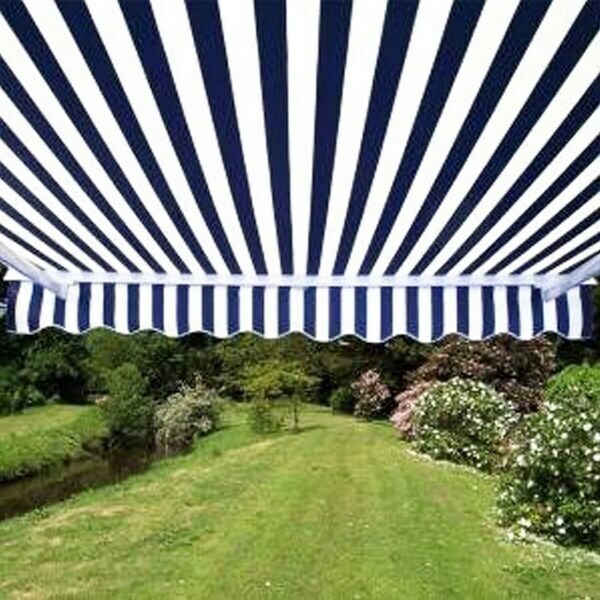 All awnings come with pre-drilled holes to make accessory attachment a breeze.